Jwala Special Home started in the year of 1996 on 1st September.By now October 2008 we have 26 children in our family. Our children are from those families which belong to the Low Socio-Economic Status and hence we eagarly await the help our Serene-Hearted well wishers to take this long way. 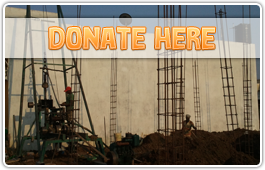 We request good Samaritans to offer donations for our proposed building at Murungapakkam, Puducherry. On March 3rd 2006 we purchased a small piece of land and we are planning to construct our home, suitable for mentally challenged girls and women. We take only girls, So we appoint only female staff's to assist the girls. Our male volunteers will come in the day time to help in the training. After finishing all my duties, then I decided not be burden to my children. I met the great DR. SARATHA MENON who was specialist in handling SCHIZOPHRENIA patients and she gave me an opportunity to ..."
Donations are Exempted U/S 80G(5) (VI).